Thumb Screw Clamp for Boom Arm and Tripod Base. Boom Length - Approx 525mm. Folding, Tripod Base with Rubber Feet. 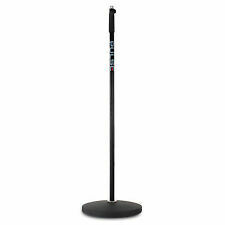 SHORT MICROPHONE STAND - BLACK - BY PULSE. High Quality Products at Great Prices. Clamp capacity: 43mm. 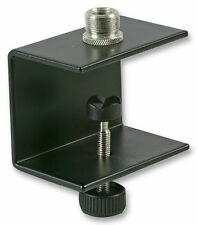 MICROPHONE TABLE CLAMP. Add to Favourites. A practical solution for the storage of microphone stands. · Stack up to 6x stands together. · ⅜" Thread. · Cast iron, horseshoe style stacking base. Our online presence were growing on a huge scale. Feature: * The PG1 Cold Shoe Pistol Grip is a convenient and ergonomic way to operate your RØDE VideoMic, Stereo VideoMic or other cold/hot shoe compatible device independently of your video camera. * A convenient 3/8” thread on the base allows connection to a boompole or microphone stand, while the spine features handy cable management. Boom length: 880mm max. Heavy duty zinc die-cast base. Images shown are for demonstration purposes. Boom length: 880mm max. Heavy duty weighted legs of solid steel & zinc die-cast base. During that process you will be issued with an RMA number. During that process you will be issued with an RMA number. 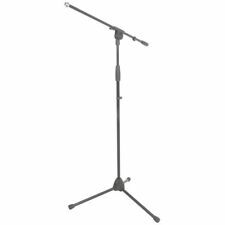 The MS 4322 B is a premium quality microphone stand with thick walled tubing, powder coated finish and 169 cm maximum height. The heavy duty round base made of cast iron is equipped with a rubber bottom to provide acoustic isolation and protect surfaces. Goliath MSBB04 Professional Quality Adjustable Tripod Boom Microphone Mic Stand. The Goliath MSBB04 is a professional quality boom microphone stand with a black die cast aluminium base for extra stability. Round base, adjustable height microphone stand. · 3/8" thread with locking nut. · Heavy cast, anti-vibration, low profile base. Our online presence were growing on a huge scale. Flight & Rack Cases. Round base, adjustable height microphone stand. ·Heavy cast, anti-vibration, low profile base. ·3/8" thread with locking nut. Our online presence were growing on a huge scale. Flight Case Hardware. Flight & Rack Cases. The Goliath MSBB03 is a high quality boom microphone stand with a black die cast aluminium base for extra stability. High quality boom microphone stand with die cast aluminium base. Boom length of 750mm. Round base microphone stand. Cast iron base with high density foam grip ring. Adjustable height via one hand grip system. Thumb screw clamp for boom arm and tripod base. 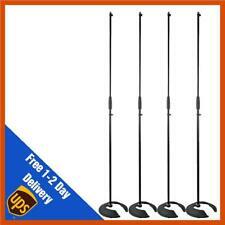 4 x Pulse Short Microphone Stands with Boom Arms. Great Quality Short Microphone Stand with Boom Model. Boom length: 525mm. Tools & Tool Kits. What's in the Box £ 29.95Buy It Now. £ 79.927Buy It Now. £ 13.59Buy It Now. £ 15.92Buy It Now. £ 5.92Buy It Now. £ 3.92Buy It Now. The MS 4322 is a premium microphone stand which features heavy-duty construction, powder coating and a maximum height of 169 cm. Boom length: 880 mm. Base type: Tripod. Type: Microphone Stands. Base material: Zinc die-cast. 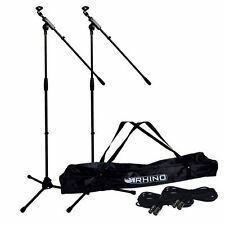 Kit comprises of full size stand with boom arm, dynamic microphone, XLR cable and carry bag. Black microphone stand with boom arm. Boom arm length 790mm. Microphone Stand Kit. 3.0m microphone lead included (XLRF-6.3mm mono jack). The Goliath MSBB04 is a professional quality boom microphone stand with a black die cast aluminium base for extra stability. 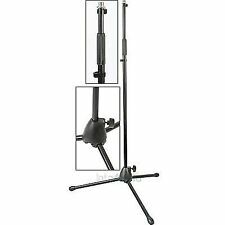 Professional quality boom microphone stand with die cast aluminium base. Die cast aluminium boom connecting parts. Thumb screw clamp for boom arm and tripod base. Boom length: 525mm. ⅜" thread with locking nut. Black microphone stand with boom arm. Boom arm length 790mm. Microphone and stand kit complete with carry bag. MICROPHONE STAND KIT. 3.0m microphone lead included (XLRF-6.3mm mono jack). Microphone holder. Heavy duty microphone stand with adjustable boom, ergonomic height grip and foldable tripod base. High Quality Professional Adjustable Boom Microphone Mic Stand. Boom length: 800mm. Full detailed specifications are available from the manufacturer's brochures or their websites. The MS 2322 B is a premium quality microphone stand with thick walled tubing, powder coated finish and 168 cm maximum height. The heavy-duty round base made of cast iron is equipped with a rubber bottom to provide acoustic isolation and protect surfaces. 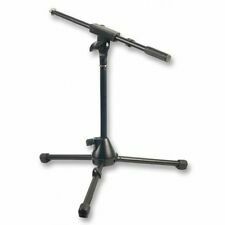 Round base, adjustable height microphone stand. Heavy cast, anti-vibration, low profile base. 3/8" thread with locking nut. Our online presence were growing on a huge scale. Flight & Rack Cases. Over the course of 2015 DY Pro Cables quickly got a hugereputation for itself for providing high quality products on a very quick service. 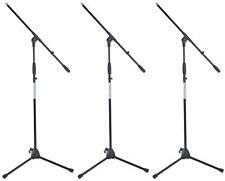 Set of 3 Malone ST-6 Microphone Stands. 3 Malone ST-6 Microphone Stands. Universal microphone stand with pivoting arm. Colour: black. cable clip and stand adapter. Material: steel. Height: 85-145cm. "MICROLITE" TRIPOD BASE MICROPHONE BOOM STAND. Constructed with strong, lightweight "Microlite" tubular steel. Perfect integration of style and functionality! Strong, impact-resistant, lightweight polycarbonate base with tubular steel tripod legs. Height range: 105 to 167cm / 41.4 to 65.8 in. Weight: 2.6 Kg / 5.7 lbs. 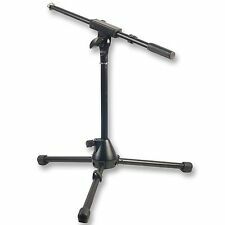 Round base, adjustable height microphone stand. 3/8" thread with locking nut. Heavy cast, anti-vibration, low profile base. Our online presence were growing on a huge scale. Flight & Rack Cases. Over the course of 2015 DY Pro Cables quickly got a hugereputation for itself for providing high quality products on a very quick service. What if I have not received my order?. When will I receive confirmation of my order?. Depth (mm): 970. Collaspable for easy storage & Transportation. Fitted with a Tripod base for balanced weight distribution. 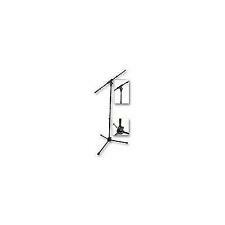 PULSE PLS00047 Short Microphone Stand with Boom. Tommy bar clamp for boom arm. Boom length: 515mm. 3/8" thread with locking nut. Heavy cast, anti-vibration, low profile base. of base: 175mm. Add to Favourites. 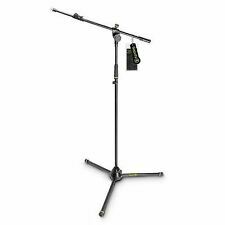 The Goliath MSBB02 is a standard boom microphone stand with a black moulded plastic base for extra stability. Standard boom microphone stand with a heavy black moulded plastic base. Longer than normal boom length of 800mm. On Stage Stands Euro Boom Microphone stand....excellent condition and unused. On Stage Stands Euro Boom Microphone stand in excellent condition. Complete with original packaging and box. Fixed length boom. Boom length: 830mm. Our online presence were growing on a huge scale. Flight Case Hardware. Flight & Rack Cases. Over the course of 2015 DY Pro Cables quickly got a hugereputation for itself for providing high quality products on a very quick service. Dixon Microphone Stand. Auctiva's FREE Counter. A bit beaten up, but fully functional. Collection only. Cash on collection also accepted.